Paracelsus (born Philip von Hohenheim) was an early-16th-century physician, chemist and pharmacist who, inspired by the legend of golden vine canes growing in Tokaj, travelled to Hungary in 1524 to study the composition of the soil of vineyards on Tokaj Hill and in the village of Tállya, as well as Tokaji wines and their impact on health. His findings were published in his book Paragranum. 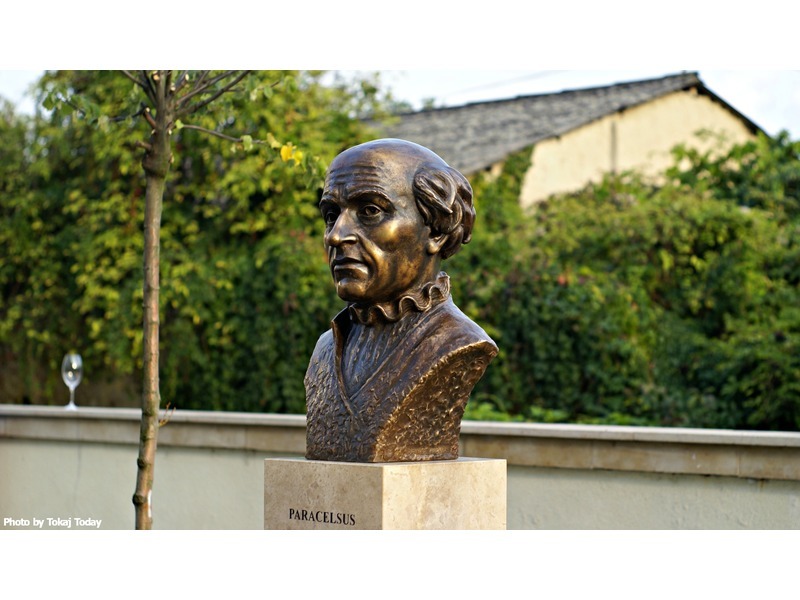 Solemnly unveiled on 16th September, his statute now stands next to Jószef Szabó's in the Tokaj Memorial Park, a project of the Tokaj Foundation, in the courtyard of Tokaj town's municipal theatre. In 2016, the Tokaj Foundation also established an award to recognise contemporary efforts for the good of the Tokaj region. The first two awardees were Dániel Kézdy for creating the book 'Tokaj – People and Vineyards' and Gergely Ripka for writing and editing the Tokaj Guide. The Tokaj Foundation was set up in 2014 by renowned Tokaj-based winemaker Zoltán Demeter, whose wife, Anett, is now managing the Foundation's many activities that by no means include the Tokaj Memorial Park project only, but also aim at fostering the production of quality photography and printing of postcards and placards using such photography, printing modern vineyard maps and reprinting historical maps and books, creating a regionally unified design for vineyard signage, as well as providing regular opportunities for local stakeholders to meet and discuss the hottest topics in the Tokaj region.